A canary is the first pet bird many people own, and many of these owners become lifelong canary enthusiasts. This little finch is a very pleasant companion bird whose cheerfulness is communicated with a melodious song that is much softer and more pleasant than that of many larger birds. The canary has been carefully bred to be available in a variety of colors and sizes, and even song variations are available. Canaries are inexpensive birds that can be purchased at just about any pet store. This undemanding little charmer is an excellent starter bird for beginners. The canary is also sometimes known as the domestic canary, in order to distinguish the selectively bred pet bird from the wild species. The taxonomical name for the canary is Serinus canaria forma domestica. The wild canary is a small finch that is native to the Macronesian islands of the Azores, Medeira, and the Canary Islands. The bird was first brought to Europe by Spanish sailors after the conquest of the Macronesian islands in 1478 and has been bred in captivity since the 17th century. The canaries sold in pet stores are now genetically quite different from the original wild canaries that are their ancestors. Canaries bred for different shapes and sizes. Canaries bred for their unique song patterns. Canaries readily cross-breed with other species of finches, and unique canaries are sometimes produced through this hybridization. For example, red canaries were achieved by breeding domestic canaries with red siskins, a South American finch. Canaries come in a wide range of sizes, with adults ranging from 4 3/4 to 8 inches from beak to tip of the tailfeathers. The average weight of an adult bird is .7 ounce. When kept as pets, canaries typically live 10 to 15 years, but the average is five to six years. Canaries enjoy the visual company of people, but this is not a bird that likes to be handled in the way that budgies and parrots enjoy it. The canary is a relatively solitary bird, though it does well in an aviary environment with other small birds. Do not house two male canaries together in a single cage, as they will likely fight. This bird will do fine when housed alone in a cage. The wild canary is greenish yellow over most of their body with yellow underparts. The domestic canary has been selectively bred to produce an array of bright colors including orange, white, red, and yellow. 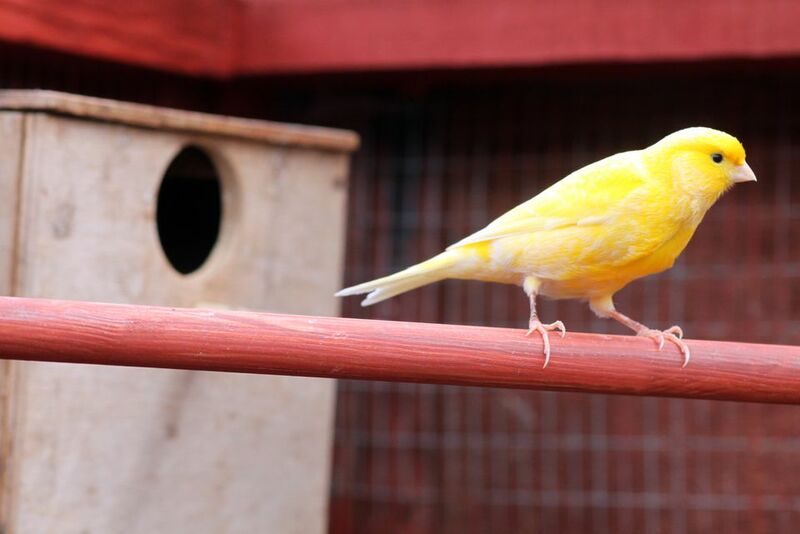 Yellow is the most common color for the domestic canary. Most pet stores sell canaries, although you may need to seek out breeders for more unique varieties. It's worth contacting rescue organizations and adoption societies to see if canaries are available, although this easy-to-care-for bird is not often given up for adoption. Canaries are often purchased for their singing abilities, but be aware that it is only the males that have notably melodious songs. Remember that canaries do not sing at all during the molt. A single canary will do fine in a cage that is roughly 20 inches wide and 24 inches long. These birds need to fly about, so if possible, give them a cage that is longer than it is wide to provide the flying space they need. Bars should be spaced fairly close together (no more than 1/2 inch) to prevent the bird from getting its head trapped. Wire cages will be easier to clean than wood cages. A pet canary should never have its wings clipped since it needs to fly for exercise. Wood perches of varying diameters (3/8 to 3/4 inch) should be placed around the cage to provide places for your canary to rest and exercise its feet. Some canary keepers alter smooth round perches by scraping them with a saw blade or utility knife, just enough to make the surface slightly irregular. This makes the perches easier to grip, and the variety will keep your bird's feet limber. Do not use sandpaper perch covers, as they can cause harm to your canary's feet. Canaries are fairly hardy birds that can be kept at room temperature, but be sure to keep the cage away from drafts, air conditioners, and windows that receive direct sunlight (the cage and canary can get overheated). Cover the cage at night—canaries need their rest and will do best if given a light/dark cycle that approximates natural conditions. Keeping them up late with artificial light is not healthy for canaries and will cause them to be stressed. Provide your canary with toys, but make sure to place them in the cage in such a way so they do not obstruct the flight space. Your canary might enjoy swings, mirrors, bells, and hanging wooden or acrylic toys. It is critical that your canary has fresh water at all times. Even a day without water can kill a canary. In addition to the regular water supply, a shallow dish of water or a special bath bought at the pet store should be provided at least three or four times a week for bathing. In the wild, canaries forage for seeds supplemented with an occasional insect, and domestic canaries should be fed a somewhat similar diet. A good quality seed mixture (coated with vitamins) designed for canaries can be the mainstay of your canary's diet. Make sure you are removing the seed shaft (or hulls) of the uneaten seeds daily so your canary has access to its food. Pelleted diets suitable for a canary can be offered as well, but these are not as palatable as seeds. Many owners keep a dish of pellets in the cage along with a dish of seeds. Feed you canary daily supplements of vegetable greens such as kale, broccoli, dandelions, spinach, celery, peas, and watercress. Regularly offer your bird small amounts of fruit, such as apples, oranges, grapes, bananas, and melons. Bits of hard-boiled egg can be occasionally offered as a protein supplement. Canaries need to move around. Minimize the clutter in its cage to give it space to flit about from perch to perch. Unlike chewing birds, a canary is fine with just a single toy, mirror, or branch in its cage, in addition to its perches. A birdbath in the cage will also provide exercise for the bird as it splashes about. Canaries are hardy birds, and the rare health issues that do occur are usually due to poor diet, a dirty cage, or drafts. Ill birds can lose weight and die very quickly, so seen help from an avian veterinarian quickly if the bird develops baldness scaly legs, diarrhea, or constipation. Canaries are very sensitive to air quality, so do not smoke around them or keep them in rooms where there are cooking vapors or fumes from solvents. Do Amazon Parrots Make Good Pets?